BT is partnering with the Indian Institute of Science (IISc), one of India’s leading research institutions, to launch a new collaborative research centre in Bangalore, it was announced today. The new BT India Research Centre (BTIRC) will join BT’s network of collaborative research facilities around the globe, including centres in Northern Ireland, China, the US, and the UAE. These global locations support the company’s strategic research agenda, generate insight into emerging technologies and develop new generations of products and services for BT and its customers. This global innovation network is centred on the BT Labs at Adastral Park, Suffolk, UK, one of the world’s leading centres for telecommunications research. The BTIRC will focus on the development of cutting-edge artificial intelligence, mobility and cyber-security technologies for use in BT’s strategic programmes, products and services. The centre’s structure and organisation will follow a well-established model used for the company’s other global research locations, combining academic, industry and government partnerships and BT’s own commercial and research expertise. Prof Anurag Kumar, Director IISc said: “Collaboration between academia and the industry is essential for making progress in the complex emerging telecommunications technologies. This will be a partnership between one of India’s premier research institutes, and a world leader in telecom technology and services. We at IISc are looking forward to exciting research results and new technologies emerging from this partnership. In July 2018, BT opened a new Cyber Security Operations Centre (Cyber SOC) in Gurugram. Using a range of advanced cyber security tools, the Cyber SOC monitors threats against BT’s own assets and its customers’ networks on a 24/7 basis, and is able to detect, analyse and mitigate cyber threats in real-time. The Cyber SOC will initially employ around 100 cyber security specialists, in addition to the team of 250 security people based separately in Gurugram, and signifies BT’s commitment to investing in its security capabilities in the region. BT has a long history of working with leading Indian universities on the development of new technologies and is a significant employer of highly-skilled IT and technology experts in Bangalore and other locations across India. 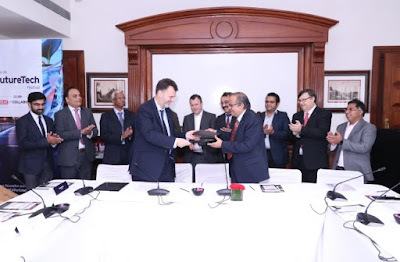 The BTIRC will complement BT’s existing relationship with the Indraprastha Institute of Information Technology, Delhi, which is focused on elastic optical networks and quantum key distribution technologies.